Hey, everybody. John Fischer, salesleads.tv. The reason we’re having this video is I wanna show you some of the tricks of the trade. You know, when you go to Google, Bing or Yahoo! and you punch in whatever it is you’re looking for, sometimes you gotta be careful. If you’re doing a private-placement, a Reg D 504, 505, 506 B as in boy,or the 506 Charlie, or the Super A, whatever it is, crowdfunding, most of the time, it requires accredited investors. And if you go into Google or Bing or Yahoo! and you punch in ‘investor lead’ or ‘investor leads for sale’ or ‘investor leads’, you gotta be careful because you’re not asking if the guy’s accredited. A lot of the stockbroker-type leads are the five thousand, ten thousand-what we call ‘pikers’, little, tiny guys, they’re not accredited, and if you buy that type of .list, that would be kinda like a infoUSA, investerlead.com type of a phonebook- it’s what we call modeled information- zip plus 4 average, they take everybody in that particular zipcode, and then take their net worth, their income, their age, household value or whatever, and then they’re bunching it as average and they are all given this particular number. And they’re about 16% accurate, and they do not work, ok? They do not work. What we do is sell accredited investors. And what is different with my stuff is they have been spoken to and vetted by a broker. So be very, very careful when you’re using a loose term, although it’s a general term- and it’s probably one of the biggest keywords that people use- you must be more specific. And I would make sure and I would caution that you use that word ‘accredited’. Make sure, if you do ask a guy for an investor lead or investor leads for sale, or I’m looking for an investor, ask him: Hey, the guy has to be accredited. Is he accredited? And that will help you out a lot because, you know what, a lot of people call me up. They say they bought some leads. They asked for investor leads, and all of a sudden found out that three quarters of the people were not even accredited. Hopefully, this tip will help you out a lot and save you a lot of money. My name is John Fischer. Thank you for your time. If you have any questions, call me: 561-239-0364. Have a beautiful day and God bless. At Salesleads.tv we compile customized targeted lead lists of high net worth individuals and investors. Some lists are entirely comprised of SEC qualified accredited investors. Other lists are screened according to recent investment activity or recent requests for information on investment opportunities, such as Private Placement Memorandums. In any event, these investor lead lists provide a key resource for your brokers to establish an accredited investor database and, most importantly, open new accounts. Our investors lists target individuals who qualify for the various types of investment opportunities described below both by meeting minimum financial criteria and by demonstrating interest in risky investments with high returns. 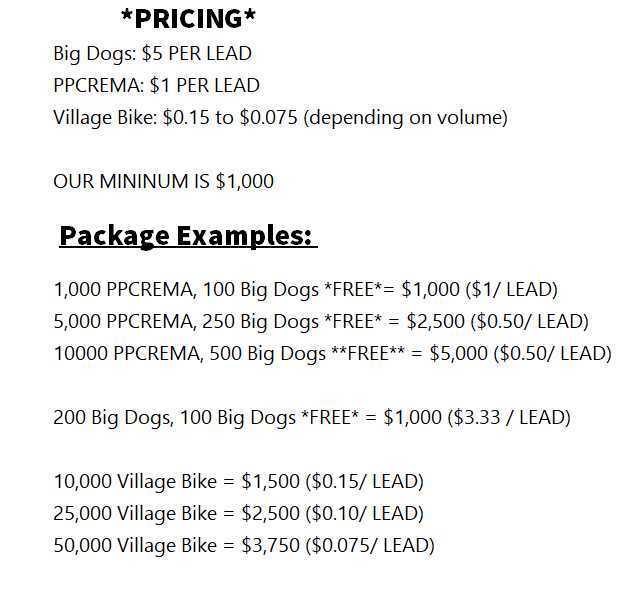 Call 561-239-0364 for one of our quality accredited investor lead lists today and put some numbers on your board! Or you may simply click here.